A ready pasta tomato sauce that invokes Sicilian tradition hand-painted with local folklore themes. 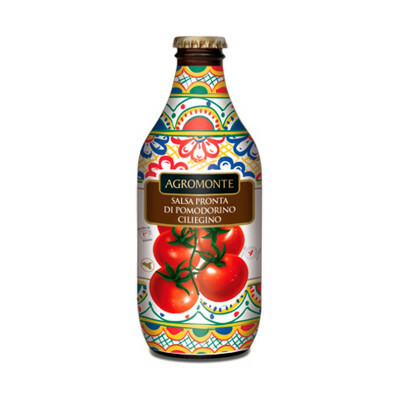 This ready to serve cherry tomato sauce is made with selected Sicilian sun-ripened tomatoes; a unique Sicilian delicacy made from the juice of real cherry tomatoes. Fresh cherry tomatoes are carefully picked and processed using simple, traditional procedures that ensure the tomatoes retain their naturally sweet taste. A unique and inimitable product with a low acidity that's great for all ages, use it as the base for an abundance of pasta dishes or stews. Cherry Tomatoes (97%), Extra virgin olive oil, salt, carrot, onion, basil, celery, sugar. CELERY. 24 months. Keeps in the fridge for up to 7 days.